Photo (We Love Horses) © Regina Brocke. Photo (Infant Spirit) © Regina Brocke. Gauthier Dance offers a plural evening inspired by remarkable women in contemporary dance. Hommage to Louise Lecavalier by Eric Gauthier and Andonis Foniadakis; exploration of memories of his youth – profoundly influenced by dance icon Pina Bausch – by Marco Goecke; new works by Helena Waldmann and Montreal-based choreographer Virginie Brunelle : contemporary dance in all it’s splendour. Quebec-born choreographer Eric Gauthier, a former soloist with the Stuttgart Ballet, is now the artistic director of Gauthier Dance // Dance Company Theaterhaus Stuttgart. This evening is the latest expression of his love of dance. Marco Goecke—a frequent collaborator of the National Ballet of Canada and the Nederlands Dans Theater (NDT), to name only those two—explores memories of his youth—profoundly marked by Pina Bausch. 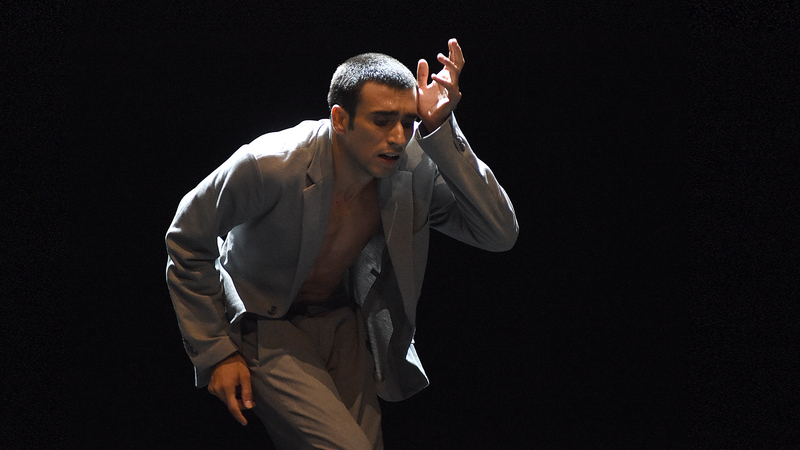 Eric Gauthier and Andonis Foniadakis present a piece dedicated to outstanding artist Louise Lecavalier, while Berlin-based choreographer and theatre artist Helena Waldmann contributes a work both poetic and political, expressed in multi-faceted movement. Finally, Montrealer Virginie Brunelle, known for her acclaimed works Foutrement and Plomb, completes the creative quartet, deconstructing classic techniques to reveal a complex and moving humanity. Choreographers Virginie Brunelle, Eric Gauthier, Marco Goecke, Helena Waldmann. Production Theaterhaus Stuttgart. Coproduction Beating (Virginie Brunelle) Danse Danse (Montreal). Supported by the New Chapter of the Canada Council for the Arts. Set Design and Costume Design Gudrun Schretzmeier. Technical Production Manager Mario Daszenies. Production Manager Alexandra Brenk. Ballet Masters Guillaume Hulot, Takako Nishi. Dancers Garazi Perez Oloriz, Anna Süheyla Harms, Rosario Guerra, Anneleen Dedroog, Sandra Bourdais, Maurus Gauthier, Luke Prunty, Alessio Marchini, David Rodríguez, Alessandra La Bella, Nora Brown, Francesca Ciaffoni, Jonathan dos Santos, Réginald Lefebvre, Barbara Melo Freire, Theophilus Veselý. Virginie Brunelle, Beating is a coproduction of Danse Danse (Montréal). With the support of the New Chapter program funded by the Canada Council for the Arts. Artistic coordination set & costumes Gudrun Schretzmeier. Technical production manager Mario Daszenies. Ballett masters Guillaume Hulot, Takako Nishi, Louisa Rachedi. Dancers Garazi Perez Oloriz, Anna Süheyla Harms, Rosario Guerra, Anneleen Dedroog, Sandra Bourdais, Maurus Gauthier, Luke Prunty, Alessio Marchini, David Rodríguez, Alessandra La Bella, Nora Brown, Francesca Ciaffoni, Jonathan dos Santos, Réginald Lefebvre, Barbara Melo Freire, Theophilus Veselý. Music Franz Liszt, Jorge Bolet, Henryk Górecki & Kronos Quartet, Max Richter. Choreography, stage & concept Helena Waldmann. Music Antony and the Johnsons. Choreography Eric Gauthier & Andonis Foniadakis. Lighting design Mario Daszenies . Ballet masters Guillaume Hulot, Takako Nishi, Louisa Rachedi. Tour management ecotopia dance productions. Artistic coordination stage set & costumes Gudrun Schretzmeier. Costumes Kerry Rees (Dir. dance costumes), Christine Lange, Katja Holzwarth, Aische Weber, Katharina Ruprecht. Mistress of wardrobe Heidi Dávila García. Stage set assistance David Fitzgerald. Lighting engineering Mario Daszenies, Lorenz Uhlig, Marcel Lyhs. Stage Holger Reuker, Karolin Seidel, Thomas Burkhardt, Lukas Dethier. Sound engineering Ruben Hauf, Philip Kannicht, Pit Schmidt. Technical directors Theaterhaus Eckhard Wiederkehr, Wanja Wenzel (dep. ).